Read-alone facts and amazing photos show you the immensity of our Solar System: comets, stars and planets. Amazing non-fiction to read alone: a visual journey to the stars. 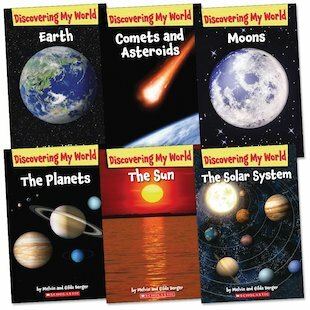 Build your reading skills as you explore the science of what lies beyond Earth. The mighty Sun, the Moon and other planets you can sometimes spot in the night sky. Lovely stuff from the bestselling team of Melvin and Gilda Berger, with all the simple facts and striking images we’ve come to expect from their books.